I cast ye out, vampire! In an era where monster mythology has become raw material for all sorts of mediocrity, Priest is one of the best examples of a broad-scale vampire blockbuster. Paul Bettany reunites with Legion director Scott Charles Stewart to command this post-apocalyptic adventure about an order of priests who battle bloodsuckers on behalf of an unappreciative human race. Contending with previous week-winners Fast Five and Thor, as well as eminently worthier competition in Bridesmaids, Priest should fare modestly during its theatrical run before finding a place on the shelves of folks who prefer monster movies to more substantive stuff. 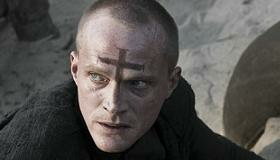 Bettany plays Priest, a defender-of-humankind-turned-ditch digger in a futuristic society where the church operates like a totalitarian corporate overlord. But when a swaggering outlander named Hicks (Cam Gigandet) asks for help finding Priest's niece Lucy (Lily Collins), the former man of the cloth goes against state wishes in order to hunt down the vampire horde that absconded with his relative. Angered, the Church sends a team of his fellow Priests to retrieve the rebel, including a Priestess (Maggie Q) with whom Priest once shared a very close relationship. But before long, when another former colleague, Black Hat (Karl Urban), threatens to unleash the undead on the remaining human populace, the warriors must join or die. I wasn't aware the world needed a vampire version of John Ford's classic western The Searchers, but now we've got one. Borrowing only a sliver of Min-Woo Hyung's original comic book series, director Stewart and writer Cory Goodman have imprinted their own cinematic influence to create a sub-bleached update of Ford's story of an innocent girl abducted by savages and the uncle who hunts them down. But though they, like Ford, do a surprisingly good job of exploring the impact of savagery on supposedly "civilized" men, at its bloody, undead heart, Priest is an action movie, not an existential meditation. And for his target audience of gore-loving ghouls, Stewart emphasizes—wisely if disappointingly—the gooey visceral payoffs. The film undercuts its own dramatic momentum by staging certain showdowns too early in the narrative, and others too late. Bettany's character is plagued by nightmares of a vampire hive where his closest friend was attacked. So why not make his return to that hive the climax of the film, instead of a random set piece in the middle of the story? Putting the proverbial vampire before the stake, Goodman and Stewart seem so eager to explore the larger universe that they created, albeit in other films, that their laser focus on this single event makes Priest feel slight, even for a second-tier summer blockbuster aimed at audiences' pulses. We want to see more action (and even more story) after the film's climactic assault on a moving train—a testament to the intriguing source material—but due to either creative or budgetary limitations, Stewart's film ends feeling like two exciting acts that desperately need a third. Meanwhile, it's easy to like the idea of Paul Bettany as an action star—he's tall, handsome and charismatic—but it seems counterintuitive to cast him as a character who shrouds himself from head to toe in black and represses all of his feelings. Only opposite Maggie Q, whose lithe physicality seems engineered for this type of fare, does Bettany become formidable, and the two of them give promising if yet-unrealized depth to the unspoken longing that lingers between their characters. But ultimately, Priest's big problem is that it mistakes taking itself seriously with joylessness; we get why they're gloomy, but the characters are so intensely unhappy that it's hard to get involved in—much less excited by. No matter how promising Priest's mash-up of Western tableaus, Matrix-style action, and vampire mythology is, there's one thing that combination shouldn't be: bloodless. Rating: PG-13 for intense sequences of violence and action, disturbing images and brief strong language.